Pompei is a fine dining restaurant in Lahore and Karachi that serves Italian cuisine with a twist in an elegant and sophisticated atmosphere. The restaurant first opened in Karachi in 2004 and is widely acknowledged as one of the finest restaurants in Pakistan. Enjoy upscale furnishings, a spacious seating arrangement, elegant decor, crisp linens and a gorgeous outdoor garden style seating area. 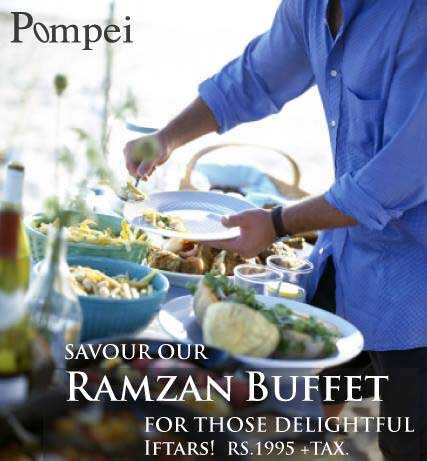 Pompei is open for lunch and dinner, with Sunday Brunch to be introduced soon in Lahore. Aside from the primary menu, there are specials which tend to change on a quarterly basis. A selection of imported meats and seafood are also on offer, alongside the signature thin crust brick oven pizzas. They take great pride in the fact that all desserts, ice cream and the range of breads are all proprietary recipes developed in-house and made fresh daily within our premises. Wherever possible fresh pasta is used instead of the dried store-bought variety and the required vegetable, meat and cheese items are imported bi-weekly from the UAE and Thailand. Pompei is widely acknowledged as one of the finest restaurants in Pakistan and has been recognized as such multiple times in print and social media. The new restaurant in Lahore is also counted amongst the top ten which has been achieved in such a short span of time. Pompei looks forward to sharing its warmth, authenticity and passion for superb cuisine with you and your family. Corporate Facilities: Business lunches, set menus and facility for larger groups. Catering: Yes, we offer catering for a minimum 40 people and maximum 150 people. Private Parties: We offer a private dining room that can seat up to 14 people. In addition, set menu options are available for large groups. Private Dining Room: Yes, a beautiful private dining room with garden view is available. Smoking Policies: Smoking and non-smoking areas are available. Cigar smoking is not allowed. What to Expect: As one of the top restaurants in Lahore, one can expect an upscale atmosphere, high-quality cuisine and attentive, friendly service. Zoom out for best view.